A string of car thefts for local dealerships has law enforcement thinking there could be a connection. KANSAS CITY, Mo. 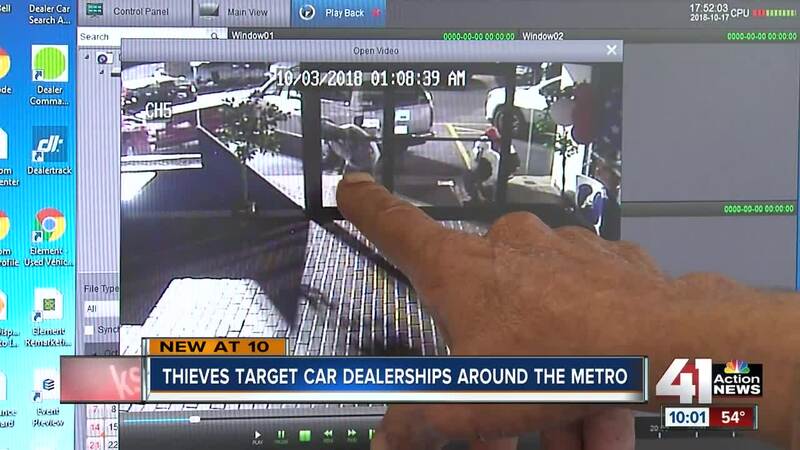 — Police are investigating a string of car thefts at dealerships across the metro that have led to at least 11 cars being stolen over the last two weeks. The first incident was reported on Oct. 3 at U.S. Fleet Sales and Lease in Blue Springs. According to general manager Billy Bell, the thieves broke through a glass door before grabbing keys inside the business and stealing three cars. Bell told 41 Action News that the theft of the three cars resulted in a loss of around $100,000. That same night, the owner of Car City Wholesale in Shawnee said thieves broke through his front gate allegedly using one of the cars stolen from Bell’s parking lot. The owner told 41 Action News that the suspects stole a Dodge Charger 392 and a Mercedes C63 from Car City. Nearly two weeks later, several other car thefts from dealerships were reported around the metro. This past Sunday, four cars were stolen from Nachbar Automotive in Bonner Springs. On early Wednesday morning, two cars were reported stolen from JKB Auto Sales in Harrisonville. A group of suspects were also recently caught on surveillance video attempting to break into a second car dealership in Blue Springs. After experiencing the crimes, the dealerships noticed a familiar figure in surveillance videos. “A lot of the car guys know each other,” Bell said. In surveillance video and pictures sent to 41 Action News from the dealerships, a black man wearing a red, black, and white jacket can be seen in two different incidents. In video captured at Bell’s dealership, the same man could be seen walking through the glass door after it had been shattered. Police confirmed on Wednesday that they were investigating the car theft cases as possibly being connected. With the suspects still on the loose, Bell said he hoped officers could find them soon. Anyone with information on any of the car theft cases is asked to call the TIPS hotline at 816-474-TIPS.